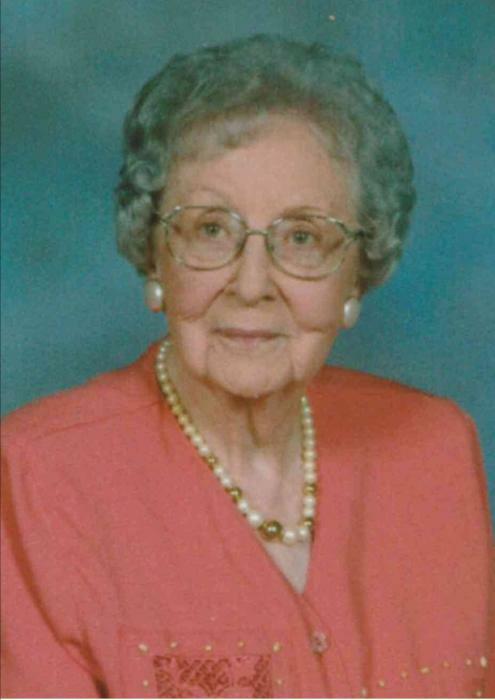 JERSEYVILLE - Edna Maureen Woolsey, 107, died at 11:50 a.m. Monday, February 4, 2019 at Jersey Community Hospital in Jerseyville. Edna was born near White Hall, Il. on January 26, 1912, one of three children born to Harry Morton and Myra Alma (Lorton) Muntz. She graduated in 1930 from White Hall High School in White Hall, Illinois. After graduating high school she taught in rural Greene County schools, and in later years substitute taught for Jersey Community Unit School District #100. She married Rupert "Chick" Woolsey on April 10, 1941 in Wright City, Missouri, and together they were the parents of three children, and shared 48 years together before his death on October 20, 1989. She assisted Chick in the daily operations of their grocery business, Woolsey Food Market, located on West Arch Street in Jerseyville for over 20 years. After its closing, she began employment with the Illinois Valley Economic Development Corporation, where she served as an assistant project director for youth and work training programs for five counties, retiring after 11 1/2 years of service. She was a longtime member of both the Jersey County Home Extension and the First United Methodist Church in Jerseyville, and was extremely proud of the fact that she was able to remain in her own home up until the Wednesday prior to her death. Surviving are a son, Tom Woolsey of Miami Beach, Fl. ; a daughter in-law, Linda Woolsey of West Palm Beach, Fl. ; five grandchildren and their spouses, Angie and Jason Shaw of Jerseyville, Jacob and Tammy Dunse of Godfrey, Marsha and Carlos Sessarego of Hollywood, Fl., Christine and Clarence Bolanos of Copper City, Fl., Matthew Woolsey, and his fiace' Madeline Lewis of Gainesville, Fl. ; six great grandchildren; a brother and sister in-law, Keith and Juanita Muntz of Greenfield. In addition to her parents and husband, she was preceded in death by a daughter, Martha Lee Dunse on July 24, 1998; an infant son, John Ralph Woolsey on March 14, 1942; a brother and sister in-law, Harry Lynn 'Pinky' and Hazel Fern Muntz; and three special nieces, Sharon (Muntz) Watts, Melody (Mourning) Muntz and Elaine (Muntz) Jilek. Visitation will be from 4 to 8 p.m. Wednesday, February 6, 2019 at Crawford Funeral Home in Jerseyville. Funeral services will be conducted at 10 a.m. Thursday, February 7, 2019 at the First United Methodist Church in Jerseyville, with Rev. Bob Taylor and Rev. Dennis Hill officiating. Memorials may be given to the St. Jude's Children's Research Hospital.